The left side has ABS push hand, the right side is equipped with stainless steel disinfectant basket, stainless steel sharp barrels basket. Two dirt bucket can be rotated 300 degrees, lateral side equips with trash. Can easily remove. 6. Two ABS drawers, one 20 grid light drawer (internal height 5CM), another 20 grid deep drawer (internal height of 12.5CM). There are free slots inside the drawer, can be arbitrarily combined. 9. Two dirt bucket can be rotated 300 degrees, lateral side equips with trash. Can easily remove. 10. The left side has ABS push hand, the right side is equipped with stainless steel disinfectant basket, stainless steel sharp barrels basket. 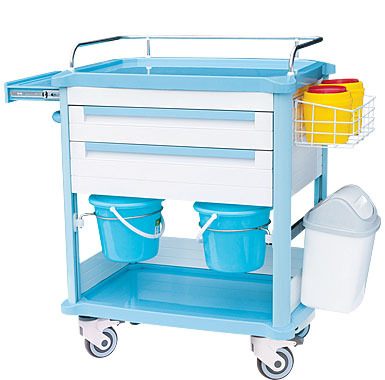 Looking for ideal Color Optional ABS Treatment Cart Manufacturer & supplier ? We have a wide selection at great prices to help you get creative. All the Rotated Dirt Bucketc Treatment Cart are quality guaranteed. 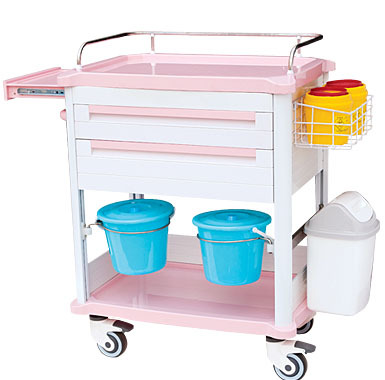 We are China Origin Factory of ABS Push Hand Treatment Cart. If you have any question, please feel free to contact us.